As I wake up at 4 in the morning to the sound of my alarm clock singing its harsh melody I can’t help but want to roll over and continue dreaming. Luckily for me I’ve placed my alarm strategically on the other side of the room as to force myself to get up. I wipe the sleep caked to my eyes and prepare them for the harsh reality that is about to confront them as I turn on the lights. My camera gear lay properly set up on the edge of the unused second bed in the room, smartly prepared the night before so that I wouldn’t miss anything in my morning stumble. I look back romantically to my empty bed and convince myself to leave by saying that I will sleep again in a couple hours. 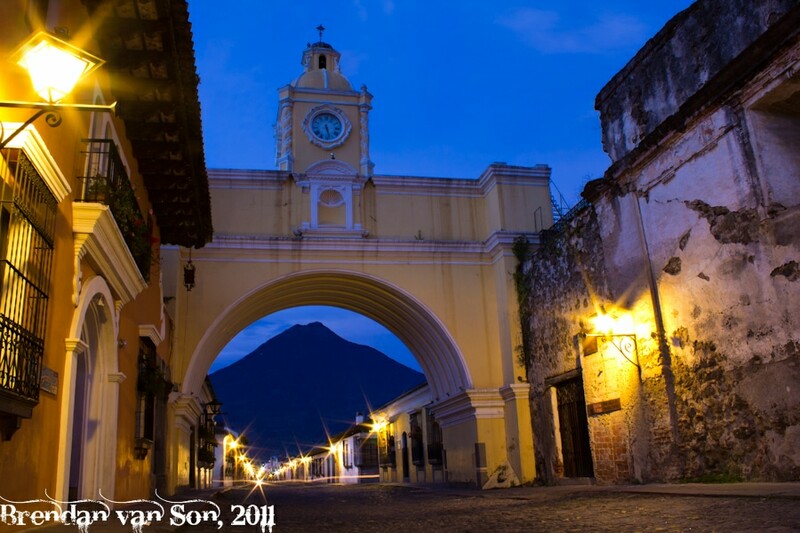 I step into the empty streets of Antigua, Guatemala and stare up at the stars still hanging gingerly in the sky. I look in the direction of the imposing volcano that stands watch over this rich colonial city. It will be the backdrop to my scene, my portrayal of this city. The cobblestone streets of Antigua seem to be have placed poorly on purpose to make sure people know that they’ve entered a colonial city, or maybe just to ensure that the people who enter know to move slowly. Although the town has grown busier as the years have passed, there is no need to move fast here. And although Antigua has grown more popular among travellers, at this time of morning I have the colonial scene to myself. I being my search for light at the old church which is painted brightly in yellow and trimmed with intricate borders of clean white stone. As I kneel down to take a photo I hear movement behind me, a dog with its nose to the ground scanning for food. My eyes can’t help but look up at the church in awe of the power the scene possesses. 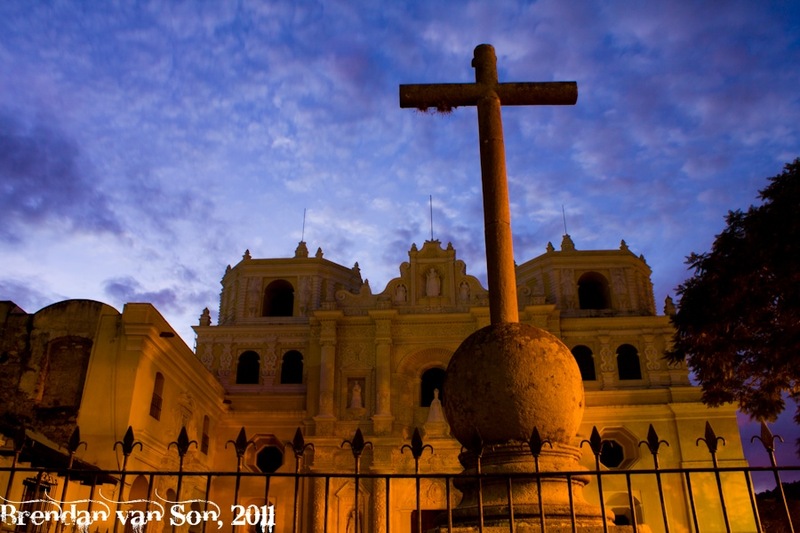 Clouds break apart dramatically as they hang over the cross of the colonial building. I am not a religious man, but there is something powerful about the combination of the power of nature and the creations of man. My gear feels heavier than usual as I drag it from its anchor in front of the church to move on to my next location. I walk down the middle of the street, there no vehicles around to persuade me otherwise. I sit myself down on a cosy rock in the middle of the cobbled road which feels softer than most stones do. I don’t even set up my camera right away, I just sit there and enjoy the serenity. 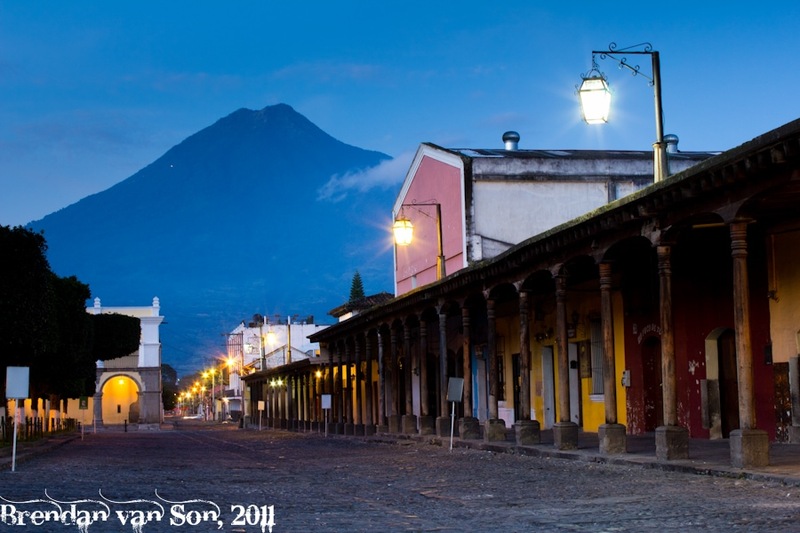 A perfect colonial arch stretches over the rough pattern of the street framing the volcano that sits in the background so unreal it looks like a poster on the back of this city’s wall. Like a giant yawn in unison I can sense the town begin to wake as I make my way into the plaza. Flags begin to snap violently on their stage as the cool wind shoots into the city. The cold stone on the buildings blushes brightly as it bathes in the rays of the morning light. Satisfied with my morning, and feeling refreshed by the morning light I walk back to my hotel. I push the handle to the large wooden door to enter. The scene at the restaurant has begun to shuffle as the smell of eggs on the grill intoxicate the air. I crawl timidly back into bed with a sense of content written all over my face. There really is nothing like having a town all to yourself as I did this morning. How timely! 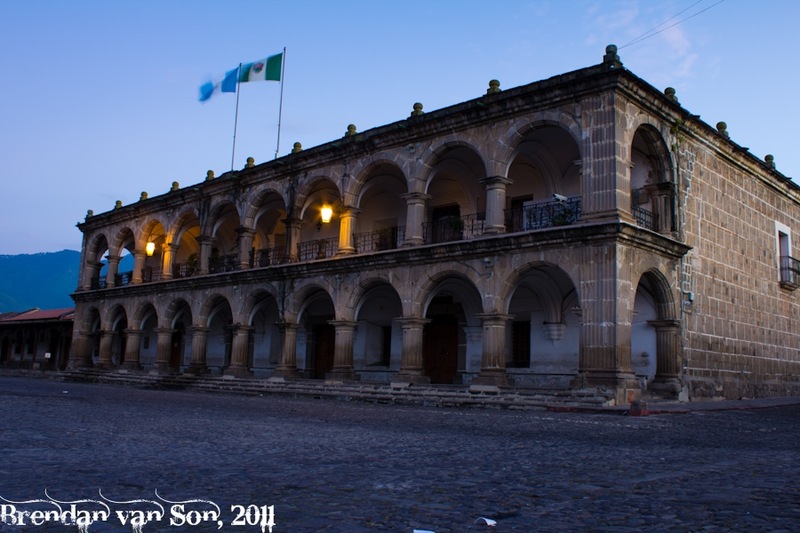 I am in Antigua right now studying Spanish! Nice to see my adopted city portrayed so beautifully! @Oneika – How long have you been there for? Inspiring!! I manage to drag myself out of bed sometimes for sunrises, because I am addicted to them….and they are right at the end of my street! But for a long time I’ve been wondering about shooting up to the capital of Tenerife, Santa Cruz, early to see how it is as it wakes, and now you have really made me decide to do it! @Linda – Gotta get up early to shoot cities. The light is best, there are less cars on the street, and you get the great experience of watching the world come to life. It’s always a good idea to wake up early and see a place wake up. A great way to get to know a city. Nice pics, thanks. Wow! Really enjoyed reading this and your shots are epic! I really have to get up early and try taking pics in this light. I’ve been here nearly a month! Which part of the city did you stay in while here? Oneika – I was just a couple blocks off of the plaza. Enjoy yourself there! Do you have more photos? These are so beautiful, I want to see more. @Sarah – I have plenty more! Maybe I’ll share some more at some point. I love taking pictures at dusk and dawn. Totally worth whatever inconvenience is assumed. wow, sweet pics. i especially love the one with volcan agua in the background. we love antigua! its actually where we met. cant wait to get back there sometime soon. 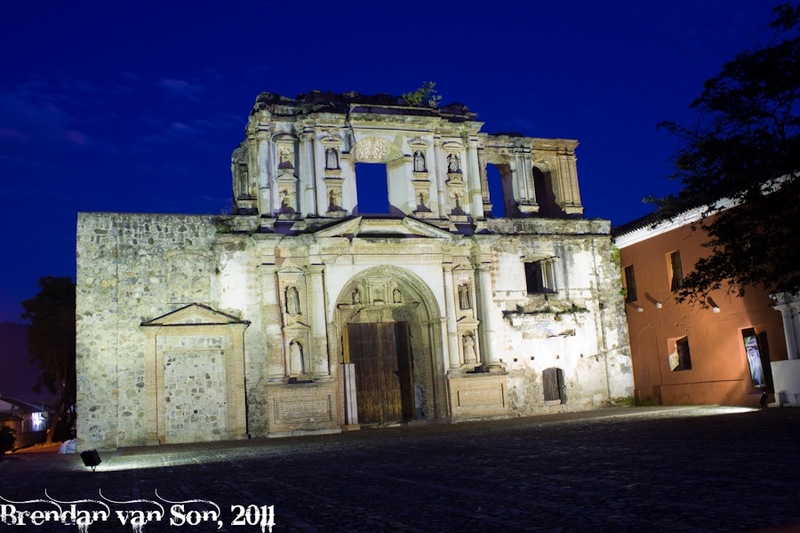 Dude, these photos are fantastic, you really captured the magic of Antigua. Will definitely be following your site from now on. Did you climb the Pacaya ? @Hans – Thanks for the comment. I’m glad you like the images. I climbed Pacaya the first time I was there but this time I stuck to town as I had some work to do getting shots for a publication. It’s a great place to be.